Celerie, always relaxed and confident, greeted me for our interview with tousled hair, eager to show me the embellishments in her collection. The Midnight Poppy bedding mixes graphic patterns with a large-scale monochromatic floral for a ying and yang effect. 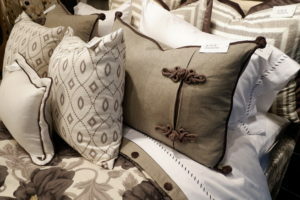 Pillows are embellished with passementerie frog closures and velvet piping, knotted at the corners. 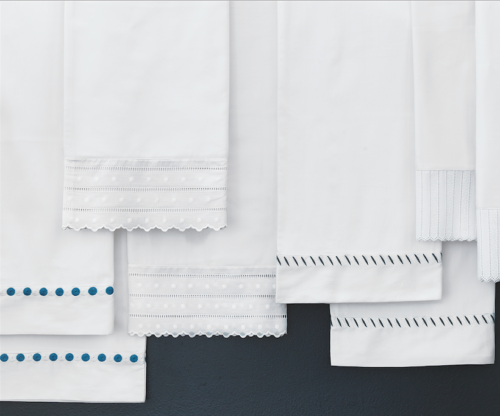 Velvet buttons secure the duvet cover and the fine linen is delicately embroidered. This ensemble goes the whole nine yards in the trim category. “It’s all the delicacies and the small gestures that define this collection: Swiss dots, lace details, picot stitches, baubles and fringe. Trimmings have become my most hearty tool, if you took the trim away, it would be like having a pencil without the lead.” Music to my ears! 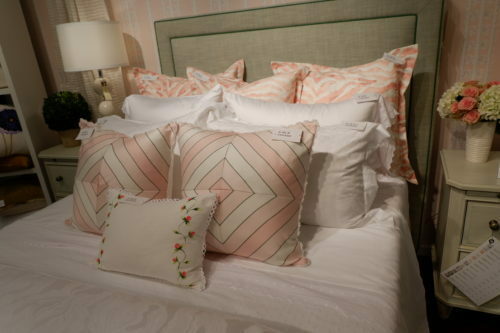 The outdoor pillows have wild patterning, concentric squares, diamonds, diagonals and stripes made out of trims, pompoms, fringes and tassels. Six interior designers were commissioned to create their dream bedrooms: Celerie Kemble, Madcap Cottage, Thom Filicia, Alexa Hampton, Barclay Butera, & Tobi Fairley. The Manor’s next stage includes building an events space that will accommodate 200 people for meetings and social gatherings. 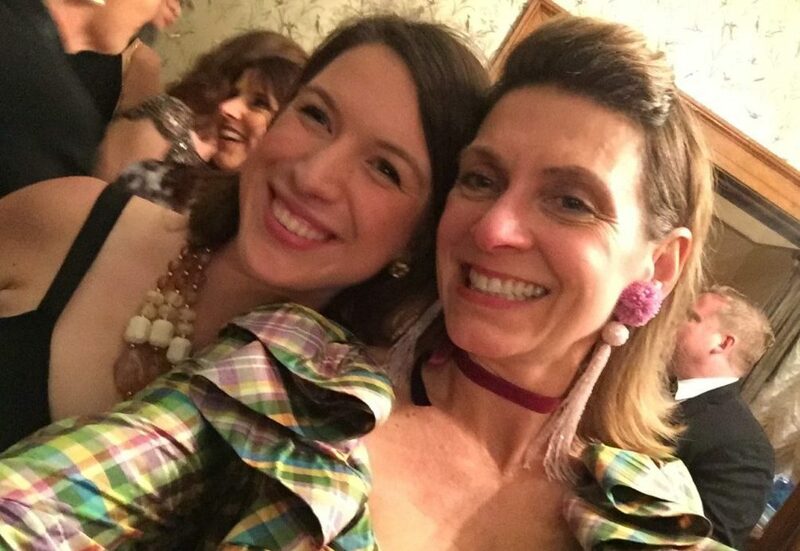 Our design bloggers group was honored to attend the black-tie Showhouse Gala celebrating this jewel. 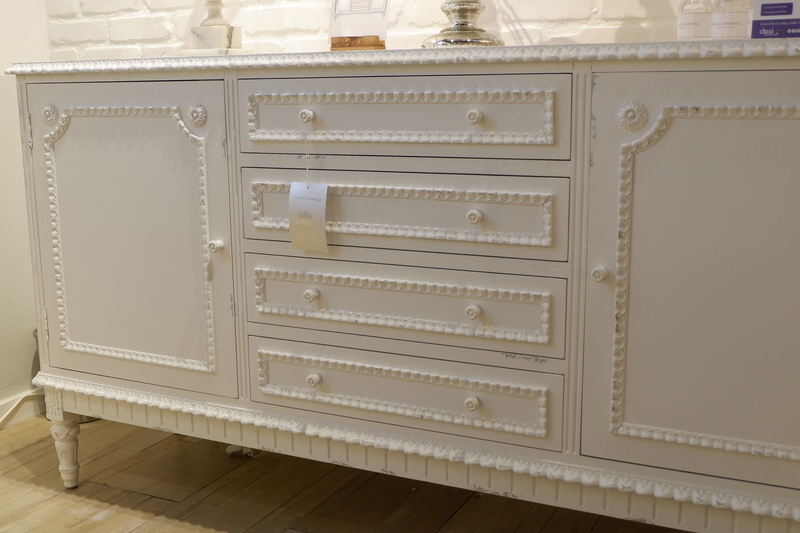 It was a huge thrill to meet Rachel Ashwell, and as I was waiting to interview her, every person that came in the showroom had stars in their eyes, enamored by her celebrity status. Rachel immediately put people at ease with her smile and “I’m just doing my thing” attitude. I recall the day I fell in love with the Shabby Chic store in Soho in the late 80’s, it was a world unto it’s own. Whitewashed, minimal, cozy, I aspired the style for my loft at the time. The word ‘lifestyle’ was not yet in the design vernacular but that’s exactly what Rachel was creating. 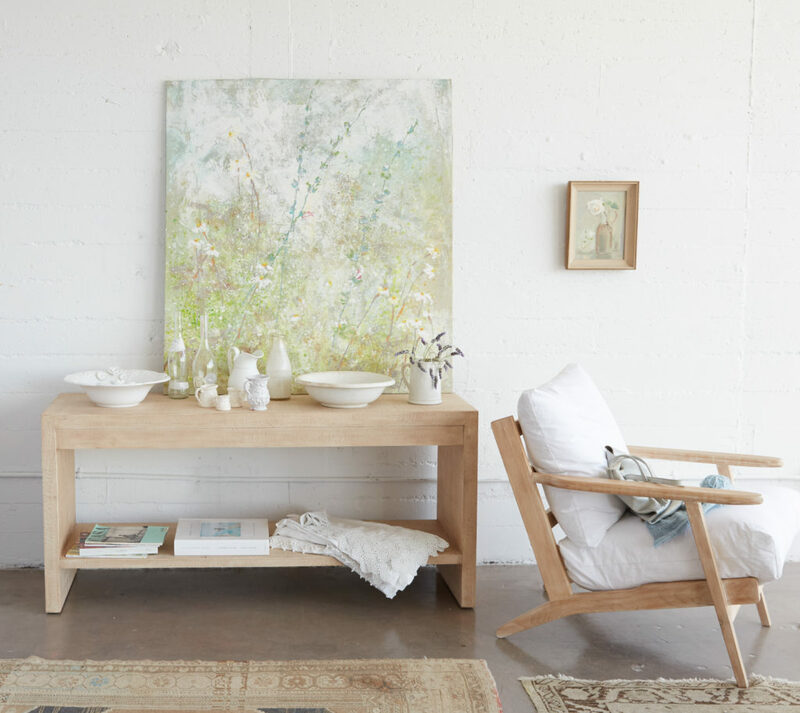 Now with a flagship store in Santa Monica, CA, two stores in Japan, a collection at Target and a Bed & Breakfast called The Prairie in Round Top, Texas, Rachel’s style has evolved yet stayed true to her roots. With this new product, the Rachel Ashwell Collection, she has created an umbrella under which Shabby Chic is at home. What is the common thread? 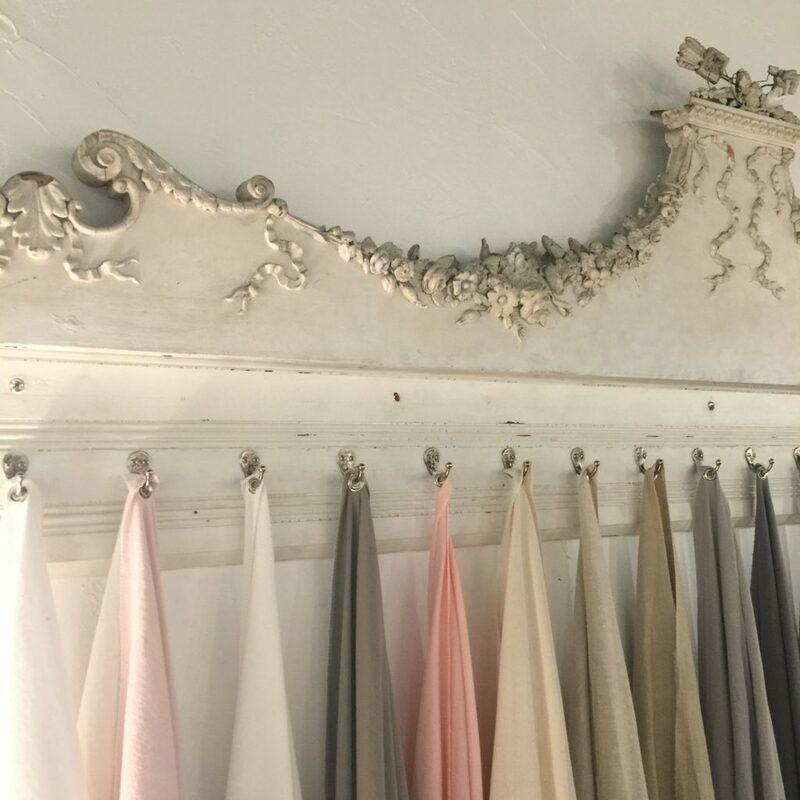 The many colors of natural fabrics with linen and cotton displayed in the showroom. 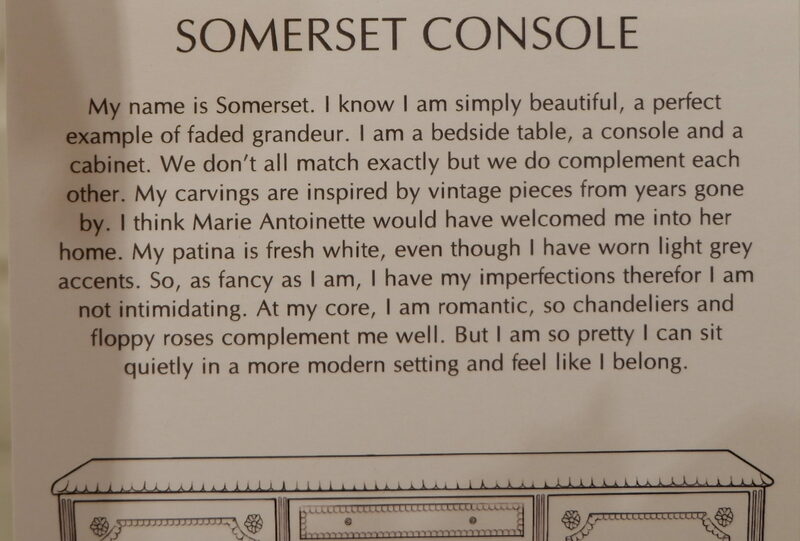 There were still moments of Shabby Chic-infused romance as seen in the carved details of the Somerset Console and her Petticoat Bedding Collection. 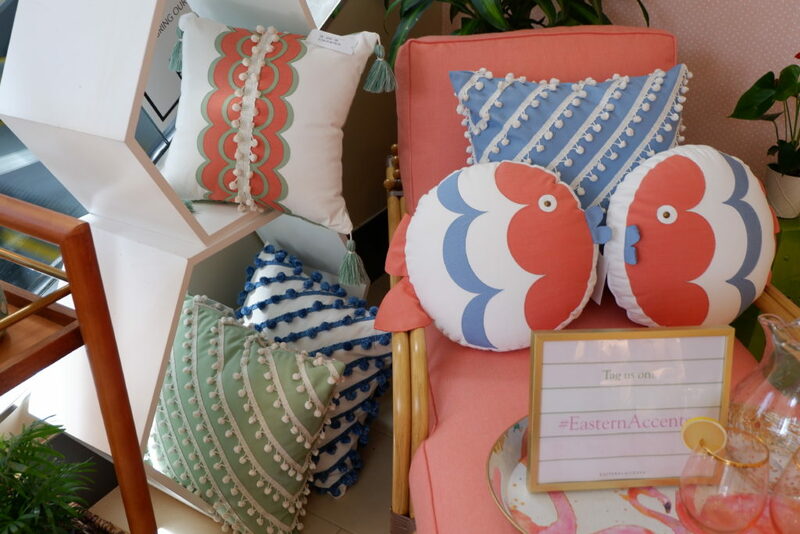 Fashion icon Alexander Julian’s Postscript Collection for Universal Furniture is aptly named for their second collaboration, 23 years after the best-selling Home Colours launch. What made his first collection so successful, transforming a formal look into one that was livable, rings true throughout this latest, “Even in the most refined setting, comfort should never be an afterthought,” he says. 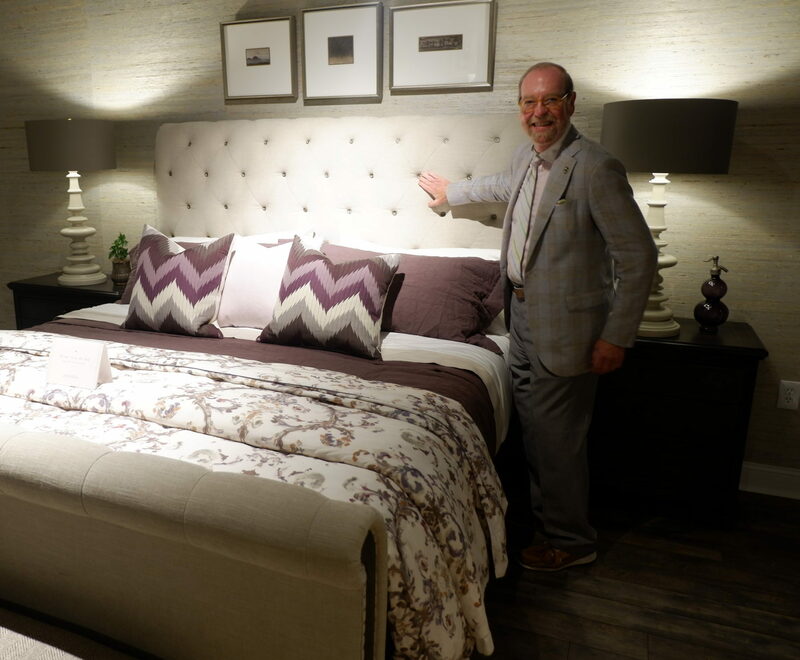 Alex’s sartorial style of “dressy casual” influences his furniture design by mixing rich materials with practicality. 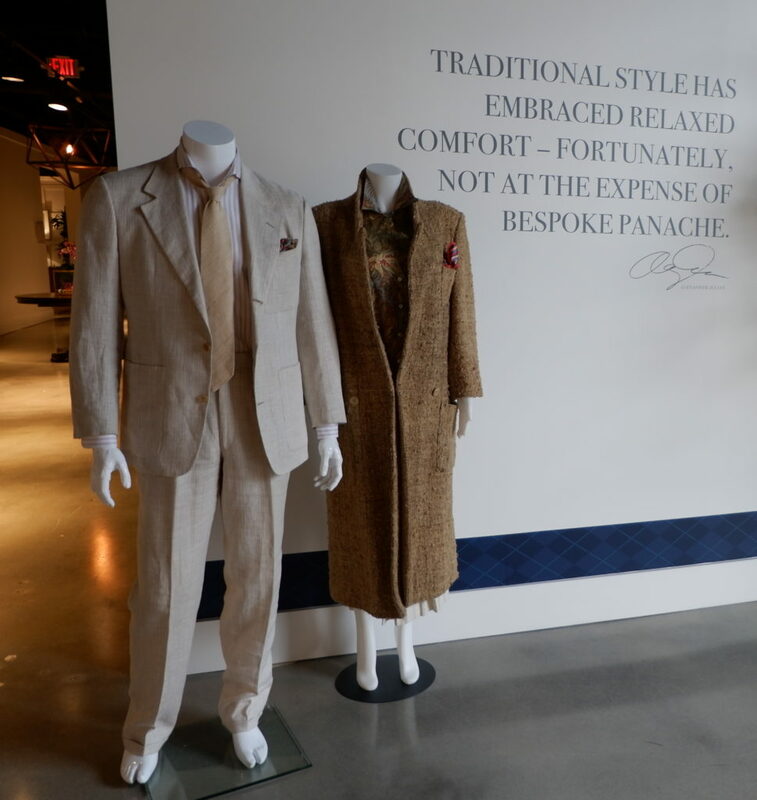 He seamlessly specifies linen or performance fabrics with pearls, and soft, woven argyles with metal buttons. 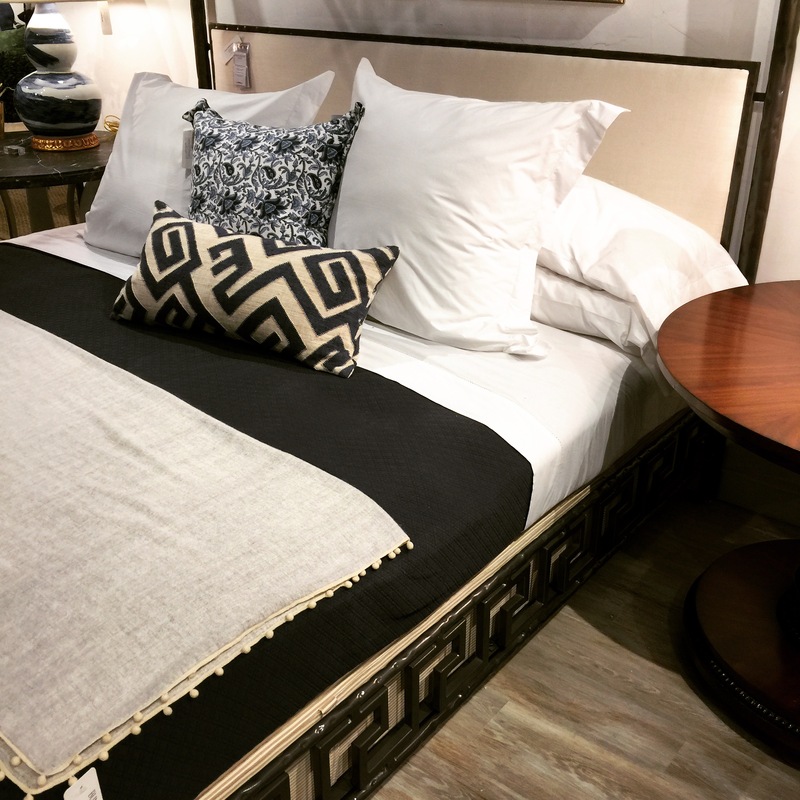 The Cute As A Button Bed, Julian’s favorite, is a sleigh bed in flax colored Crypton fabric diamond-tufted with metal buttons. 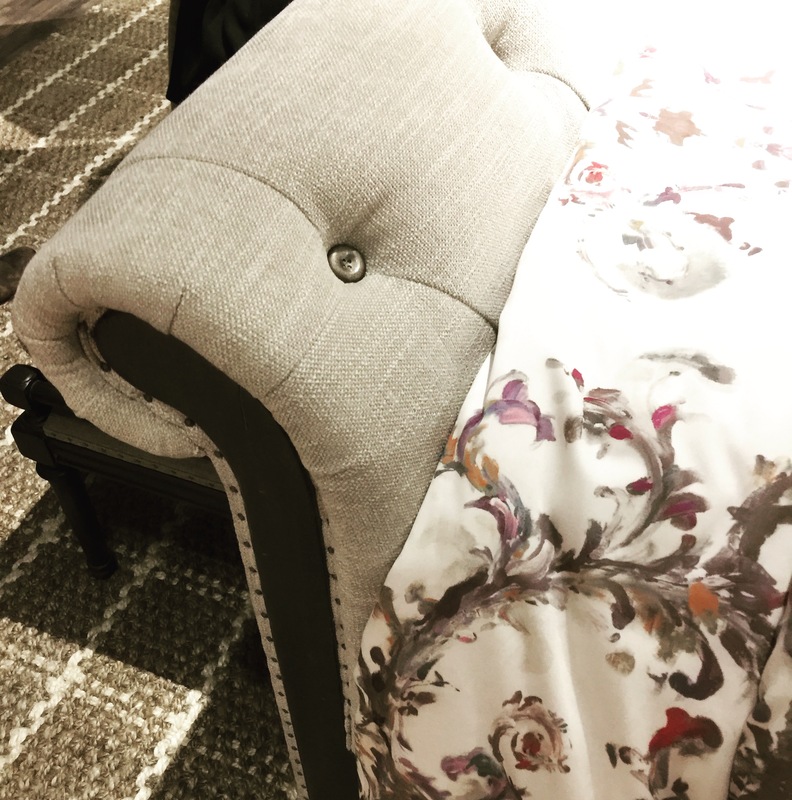 Sparse nailheads, in an antique silver finish, frame the upholstery. Metal buttons are used for tufting. 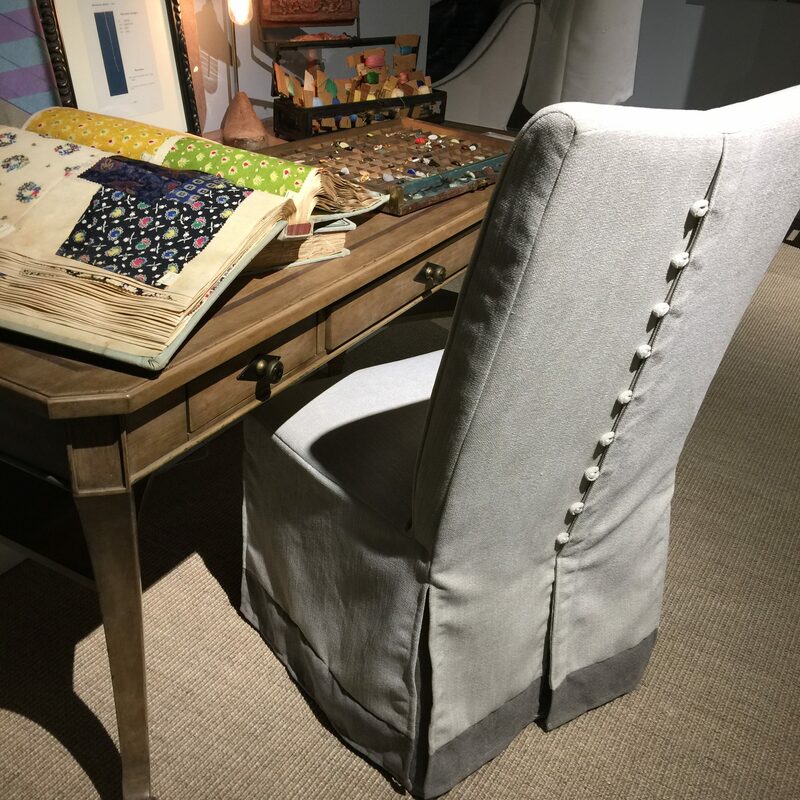 The Dressmaker Chair has a pleated skirt that reveals a contrasting underskirt and features faux pearl buttons with loops down the back. 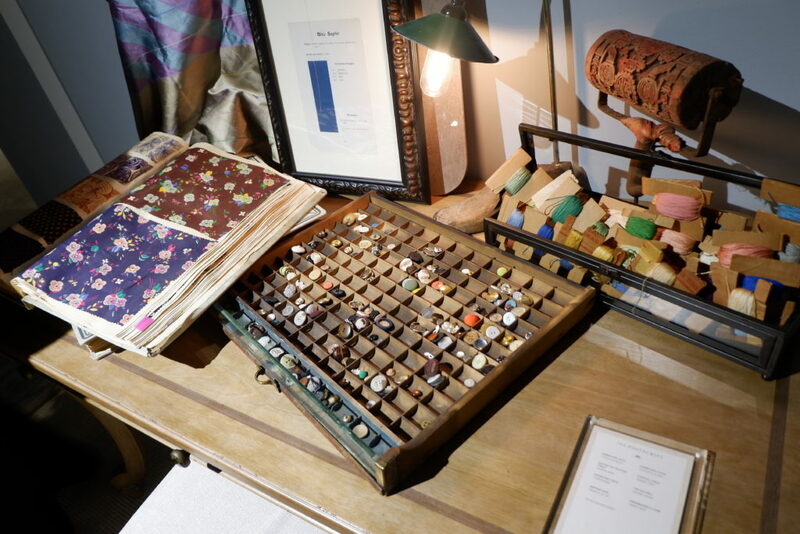 I loved all his display details of vintage textile swatch books, buttons and faded thread. It gave a classic attention to detail vibe. 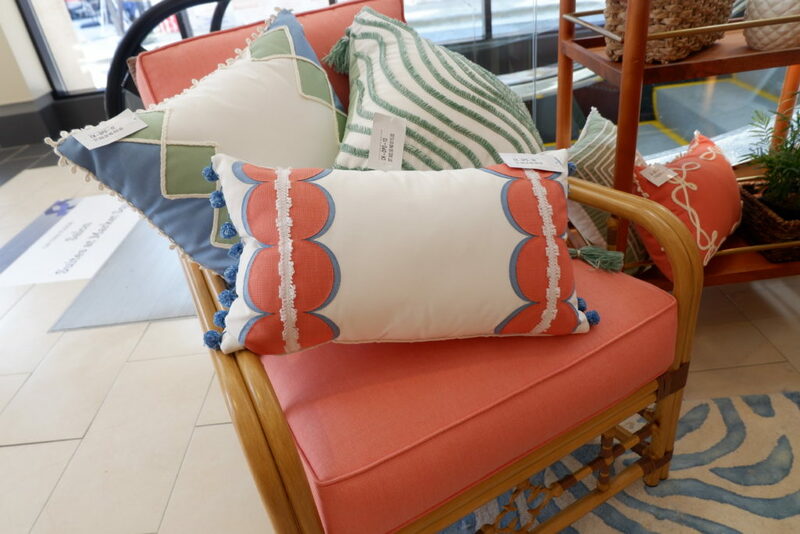 At the Bunny Williams Home showroom in Interhall, the collection is an expression of legendary Interior Designer Bunny Williams’ creativity and educated aesthetic. 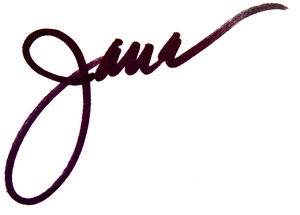 The pieces call upon her decades of design experience and her extensive knowledge of decorative history. 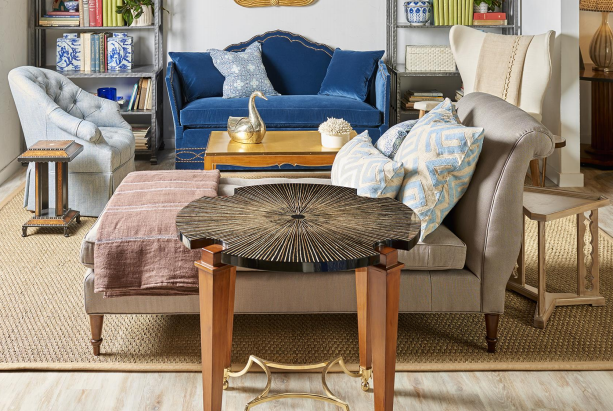 “I started Bunny Williams Home to fill a void in the marketplace for those unique pieces one needs to give a room personality. I am always on the hunt for unusual things. 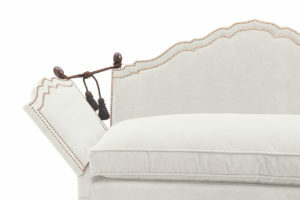 The Parker Sofa, for instance, is inspired by an antique Knole-style sofa that Bunny had in her library for many years. The original Knole settee had high sides with hinges that kept in the warmth of the hearth. They lowered to create a daybed for napping, or relaxed contemplation. It was commissioned for the Great English house of the 1600’s. I am sure Bunny has had many warm, contemplative moments on hers. 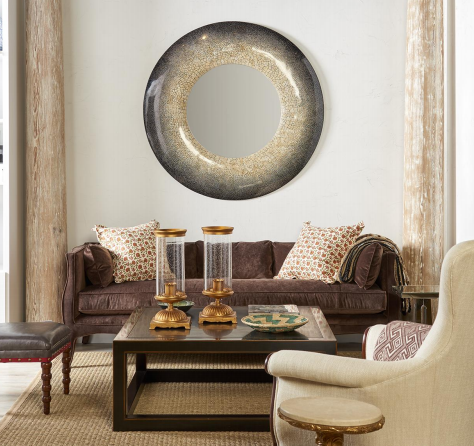 One of Bunny’s favorite pieces in the collection is the Dappled Mirror. It is made completely by hand in a wonderful factory in Vietnam using the time-honored, traditional technique of eggshell lacquer. Each Dappled Mirror is truly a work of art. 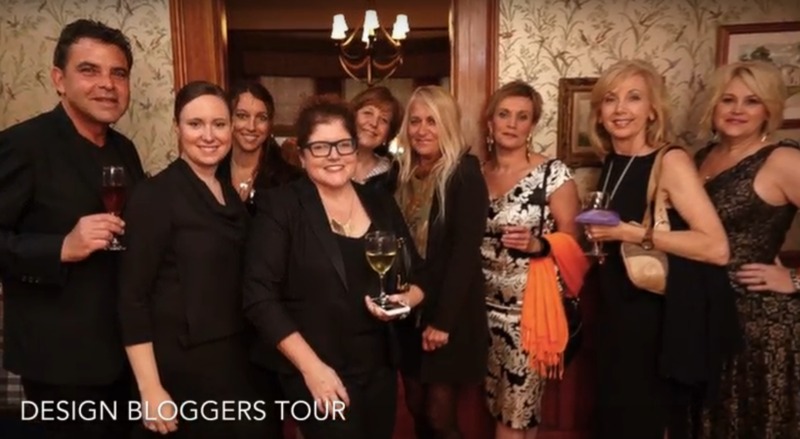 Being on the Design Bloggers Tour has been a privilege and has given me the opportunity to go beyond my usual market tour, to probe what is on-the-surface interesting and learn from these designers the great effort, passion and expertise that has brought their collections to fruition. 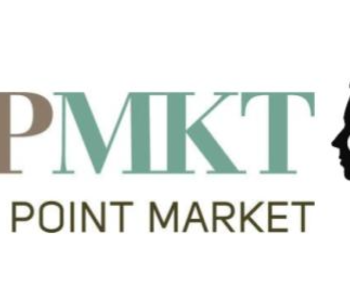 Stay tuned for my final Design Bloggers Tour post with scenes of Modern Embellishments of and other High Point Market Spring 2017 mega-moments. Thanks for reading and keep #trimspotting!! ***This is a sponsored post however all observations and opinions are my own. Loving all the information and Beautiful designs. Looking forward to much more.